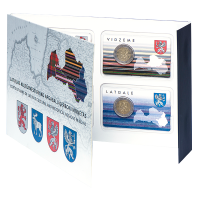 Комплект "Видземе + Латгалия + Курземе + Земгале"
The coin set "Coats of arms of Latvia's cultural and historical regions in coins" contains all four 2 euro commemorative coins, i.e. "Vidzeme" (2016), "Kurzeme" (2017), "Latgale" (2017) and "Zemgale" (2018), dedicated to the cultural and historical regions of Latvia. The division of Latvia into cultural and historical regions (Vidzeme, Latgale, Kurzeme and Zemgale) is stipulated by Article 3 of Satversme (the Constitution of the Republic of Latvia). As a contribution to Latvia's centenary, Latvijas Banka is issuing four euro commemorative coins featuring the coats of arms of Latvia's cultural and historical regions. The symbols incorporated in the coats of arms established by the Regulation on Coats of Arms of Latvia's Regions (1930) are related to historical developments in the present-day territory of Latvia. In 2012, a special law was passed to lay down legal protection of these coats of arms as national symbols. The coats of arms of Kurzeme and Zemgale originate in the heraldic symbols of the Duchy of Courland and Semigallia of the 16th–18th centuries. A silver elk on a blue background, featured on the coat of arms of Zemgale, and a red lion on a silver background, turned in the opposite direction and depicted on the coat of arms of Kurzeme, have been carried over from the coat of arms of the Duchy of Courland and Semigallia. The elk symbolises the richness of nature, while the lion is one of the most common heraldic symbols and represents strength and power. Vidzeme and Latgale obtained griffin as their heraldic symbol at the end of the 16th century, when the Duchy of Pārdaugava was formed on the right side of the Daugava in the eastern part of the present-day Latvia. A silver griffin on a red background with a sword in its right paw can be seen on the coat of arms of Vidzeme (on a red background) and on that of Latgale (on a blue background turned in the opposite direction). The author of the graphic design (of the national side): Laimonis Šēnbergs. The author of the plaster models: Jānis Strupulis.